Scotch Whisky (no –ey unless you're referring to Irish or American Whiskey) has always intrigued me. Single malt, or single distillery, Scotch, such as Laphroaig's 10 year old is full of rich smoky peat scents. But then, if I try and take a sip neat (i.e. straight, no water or ice), its power punishes my throat and sinuses (picture the classic M*A*S*H episode with Radar taking a shot, wheezing and then hoarsely proclaiming it to be, "smoooth."). While production methods differ somewhat from region to region, the general Whisky recipe starts off with malt (commonly barley or rye based), which is akin to the starter for your sourdough recipe. For example, barley is malted by allowing the grain to germinate – this releases enzymes that convert starch into sugar. The malt is then often dried, often over peat burning fires (hence the smoky peat scents in your glass of Scotch). The dried malt is then soaked and partially dissolved in water. This produces something called wort. Yeast is added and the fermentation commences. At a relatively weak alcohol level (~ 5%) the wort is moved to a still and readied for multiple distillations. Malt whisky is distilled in pot stills, while grain-based whiskies are distilled in Coffey stills. After distillation, the baby whisky is aged in 'seasoned' barrels – depending on the region and style. For example, Scotch Whisky is aged in used sherry barrels that have been charred on the inside. Then the producer waits 10, 15, even 40 years. Just as in wine, aging causes whisky to evolve secondary aromas and flavors. Although, at upwards of 40-50% alcohol, flavor maturation might not be readily detectable. But then I could be wrong; I am no Whisky connoisseur – just a Whisky experimenter. I am indeed curious to hear from any Whisky lovers out there about what they look for and how they evaluate their distilled treat. 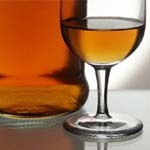 If your whisky curiosity hath been piqued, check out this nifty blog - The Scotch Blog. I discovered bourbon thanks to l'homme de ma vie. I prefer it to scotch whisky. I think it had something to do with a gentler, sweeter aroma and flavor. If you like Bourbon (and who doesn't like good Bourbon) try the Balvenie 12 year old DoubleWood, the next time you are out. Not all Scotch is heavy, harsh and smoky. Thanks for the recommend Kevin; I'll seek out the Balvenie. I really want to learn and sample more, varied Scotch styles. Your blog will be of great assistance in my Scotch-learning. Bourbon Whiskeys have really made a come-back over the past few years. For a while in the 80s and early 90s, they were losing market share to clear distilled spirits. But the advent of boutique 'single barrel' Bourbons has brought the publics attention back to it. The only premium Bourbon I have tried is Woodford Reserve. It is a good sipping whiskey. But what I drink most often is Jim Beam Black Label. It is quite tasty, but not as expensive as Woodford Reserve, Bulleit, Four Roses, Blantons, and other boutique brands. Hi! thank you for allowing me to participate in this forum that I've always liked to visit that addresses important and interesting topics, I would join efforts to make a contribution on the importance of the size of wine glasses, Having this in mind, Burgundy wine glasses should be not too big, not too small, this is because there are no established rules regarding this, there is nothing else but pure common sense, and of course, you don’t want your Burgundy wine glasses to be greatly huge, nor you want then to look pity, you want a glass of wine that looks in a proportional size that is not vulgar either. Wine appeal you want to be of a great visual aspect, and to have that, is what you should aim for when in the search for the correct Burgundy wine glasses. Have you heard of sea food? Well, maybe it is a great thing that you take your partner to have some sea food, it is a known fact that oysters give that like extra when it comes to a little arousal just before the big thing, and it is also a bit known that these same oysters have a great effect on man’s performance, so you know that with these kind of foods nothing could ever go wrong in bed.